These are my live-TeXed notes for the course Math 268x: Pure Motives and Rigid Local Systems taught by Stefan Patrikis at Harvard, Spring 2014. Any mistakes are the fault of the notetaker. Let me know if you notice any mistakes or have any comments! Let be a field with algebraic closure (so ). Consider smooth projective varieties over (either dropping the word smooth or projective will force us to enter the world of mixed, rather than pure, motives). There are several nice cohomology theory. the Betti realization (a -vector space), the singular cohomology of the topological space . the de Rham realization (a -vector space with a Hodge filtration), the algebraic de Rham cohomology = the hypercohomology of the sheaf of algebraic differential forms on . the -adic realization (a -vector space with -action), the -adic etale cohomology. These isomorphisms are functorial and satisfy other nice properties (indeed an isomorphism of Weil cohomology, more on this later). This suggests that there is an underlying abelian category (of pure motives) that provides the comparison between different cohomology theory. Standard conjecture C: Kunneth (the category of pure motives is graded and has a theory of weights). Question Why should one care about the existence of such a category? One motivation is that one gets powerful heuristic for transferring the intuition between different cohomology theory. Example 1 By the early 60's, one knew that if is a smooth projective variety, then it follows from Hodge theory that naturally carries a pure Hodge structure of weight , i.e. a -vector space with a bi-grading such that , where is the complex conjugation with respect to . On the other hand, Weil had conjectured that for a smooth projective variety . The -representation is pure of weight , in the sense that the eigenvalues of the geometric Frobenius are algebraic numbers and for each embedding of into the complex numbers, . When is smooth but not projective, people played with examples and found that can be filtered (the weight filtration) such that the Frobenius eigenvalue is pure on each graded piece. The above mentioned -adic intuition (generalized to higher dimension) lead Deligne to mixed Hodge theory. To give a mixed Hodge structure for not smooth projective, the key point is to find a spectral sequence such that its term is (conjecturally) pure of weight . In Hodge II, Deligne treated the case of smooth but no longer projective varieties . The ( -adic analogue of the) spectral sequence is the Leary spectral sequence for , where a smooth compactification of with is a union of smooth divisors with normal crossings, One can explicitly compute the sheaf where is smooth. Therefore is pure of weight . Let us look at the differential : notice both the target and the source are pure of weight (all are pure of weight ), nothing is weired. But on the -page, , where the source has weight and the target has weight respectively. The mismatching of the weight of the Frobenius eigenvalues implies that for . Therefore the Leray spectral sequence degenerates at -page. One can compute that The Betti analogue (of maps of pure Hodge structure) is provided by the reinterpretation that and the differentials 's are simply Gysin maps ( = Poincare dual to pullbacks), which are also maps of pure Hodge structures. The upshot is that the -adic Leray spectral sequence gives the weight filtration (= the Leary filtration up to shift), and the graded piece is pure of weight . The Betti Leray sequence also gives a weight (defined to be) filtration on such that we already know that are naturally pure Hodge structures. Another motivation for considering the category of pure motives is toward a motivic Galois formalism. Example 3 Let be a field. The classical Galois theory establishes an equivalence between finite etale -schemes with finite sets with -actions. Linearizing a finite set with -action gives finite dimensional -vector spaces with the continuous -action . The linearization of finite etale -schemes are the Artin motives (motives built out of zero dimension motives). The equivalence between the two linearized categories is then given by . Generalizing to higher dimension: the category of finite etale -schemes is extended to the category of pure homological motives. The Standard conjectures then predict that it is equivalent to the category of representations of a certain group , which is a extension of classical Galois theory These are still conjectural. But one can replace the category of pure homological motives by something closely related and obtain unconditional results. In this course we will talk about one application of Katz's theory of rigid local systems (these are topological gadgets but surprisingly produce motivic examples): to construct the exceptional as a quotient of (the recent work of Dettweiler-Reiter and Yun). We now formulate the notion of Weil cohomology, in the frame work of motives. Definition 1 Let be a field. Let be smooth projective (not assumed to be connected) variety over . Let be the category of such varieties. Then is a symmetric monoidal via the fiber product with the obvious associative and commutative constraints and the unit . Definition 3 A Weil cohomology over (a field of characteristic 0) on is a tensor functor , namely, comes with a functorial (Kunneth) isomorphisms respecting the symmetric monoidal structure. Notice the monoidal structure induces a cup product making a graded commutative -algebra. We require it to satisfy the following axioms. (normalization) . In particular, is invertible in . We define the Tate twists (this is well motivated by -adic cohomology). Under , one has . factors through the Chow group (modulo the rational equivalence). For , . Notice is not necessarily a combination of integral closed subscheme (e.g., is nonreduced), the cycle should be understood as the reduced structure with multiplicity. (pinning down the trace) the composite sends to , where are closed points. Remark 1 Sometimes the Lefschetz axiom is also thrown in the definition of Weil cohomology. We will talk about this later. Remark 2 We set . This means via the comparison isomorphism, the image of is . If we take granted that the comparison isomorphisms are compatible with Mayer-Vietoris. Applying Mayer-Vietoris to , then we are reduced to the calculation on ( ). The isomorphism is given by here is a smooth 1-chain. A good -basis of is given by the differential . Choosing a simple loop around the origin, then one obtains . Example 4 (Trace in Betti cohomology) Let be smooth projective of dimension . Define to be the composite where is the smooth de Rham complex with -coefficients. Notice is an isomorphism because the sheafy singular cochain complex is a flasque resolution of and is an isomorphism because is a fine resolution of . The choice will chancel out the choice of the orientation we made on complex manifold when we do integration and one can check that lands in . Suppose is a field of characteristic 0 and smooth (not necessarily projective). Definition 4 We define the algebraic de Rham cohomology to be the hypercohomology of the sheaf of algebraic differential forms on . Theorem 2 is a Weil cohomology. We now selectively check a few of the axioms. Lemma 1 is a tensor functor. Remark 3 To check that is finite dimensional for smooth projective, one can use the Hodge to de Rham spectral sequence and the fact that each is finite dimensional (this may fail when is not projective) and lives in a bounded region. For not necessarily projective or smooth varieties, is still finite dimensional (by comparison, and by the resolution of singularities in characteristic 0). may fail to be finite dimensional in characteristic for nonprojective varieties (see the next example). Example 5 When is affine, we have (this follows from the vanishing of for affine and quasi-coherent; in particular, ), which makes the computation feasible. For example, the de Rham complex for is simply . So taking cohomology gives and . This also gives an example in characteristic that is infinite dimensional because , so one don't really want to work with the algebraic de Rham cohomology in characteristic ! In general, one covers by open affines . For any quasi-coherent sheaf on , one then obtains the Cech complex , a resolution of by acyclic sheaves, defined by Now we have a double complex whose columns are acyclic resolutions of . The general formalism implies that the cohomology of the global sections of the total complex. Recall the total complex is defined by where . Example 6 (normalization) Let and be a covering of . The Cech double complex looks like The total complex is thus where the two differentials are given by and One can easily compute , and is 1-dimensional generated by . Indeed one sees the computation really shows This is an instance of the Hodge to de Rham spectral sequence. Remark 4 The Hodge de Rham spectral sequence comes from filtering the total complex of the double complex . Take the filtration (cut out by right half planes) So itself forms a complex. The general machinery implies that the spectral sequence associated to this filtered complex is Here defines the filtration on (so the grading on the right hand side makes sense). Notice in our case, is simply and is nothing but . Remark 5 What happens when one filter the total complex in the other way (by upper half planes)? Namely Then we see that . The corresponding sequence is the Mayer-Vietoris spectral sequence. When the covering consists of two affines, it recovers the usual Mayer-Vietoris long exact sequence. Theorem 3 If and is projective, then the Hodge to de Rham spectral sequence degenerates at the -page. Remark 6 It is not clear how to obtain the splitting without Hodge theory. To define the trace for the algebraic de Rham cohomology, we proceed in two steps. We first show that is abstractly the right thing, i.e., and is if is geometrically connected. Then we pin down that actual map after defining the de Rham cycle class map. The first step uses the Serre duality. By the Hodge to de Rham spectral sequence, we have a map By Serre duality ( is the dualizing sheaf), one has the trace map So we want to say that the map is an isomorphism. By the Hodge de Rham spectral sequence, it is enough to show that (or because is a free -module of rank 1). This can be checked bare-handed by reduction to : choose a finite flat map to get the trace map (so ). It follows that is injective. It suffices to prove that which boils down to the direct computation that using the Hodge to de Rham spectral sequence. To pin down , we need to choose carefully a generator of and set i.e., . We seek a cycle class map such that as follows. Define the Chern class of line bundles. Define the Chern class of vector bundles. Define the Chern character of vector bundles on . One knows that factors through , Grothendieck group of vector bundles on . Using the fact that is smooth, the latter can be identified with , the Grothendieck group of coherent sheaves on . Now we describe each step in details. Step a We want a group homomorphism . Identify . The map induces a map and hence induces the desired map . Step b Let be a vector bundle of rank on . Denote the projective bundle . Notice on has a tautological line subbundle . Let . The fact (the Leray-Hirsch theorem, a special case of the Leray spectral sequence) is that is a free module over with basis . We then define by Notice this agrees with the previous definition of of line bundles and is functorial in . Define the total Chern class The key is the following multiplicative property. Proposition 1 For any sort exact sequence of vector bundles we have . Proof To show this, one first show that if is a direct sum of line bundles, then Then reduce the general to the first case by showing that there exists a map such that splits as direct sum of line bundles and is injective on (the splitting principle). For the first case, since the statement is invariant under twist, one can assume each is very ample of the form and reduce to the case to the case of being a product of projective spaces. Notice that each gives a section and by definition . Write . Pullback the defining relation for along each , we obtain the relation So the polynomial in has roots . But has the advantage of being like a polynomial ring, Assume , then the defining relation must be , which shows that is the -th symmetric polynomial of as desired. When is smooth, one can form finite locally free resolutions of any coherent sheaves on , and taking the alternating sum of the terms in the resolutions induces the inverse of natural map . Thus (see Hartshorne, Ex III.6.8). Step d For a codimension cycle, makes sense and we define the cycle class map In particular, our choice of the basis for is given by for any closed point of , This is the choice we made to normalize the trace map. We need to check that is independent on the choice of (this follows from connecting two points by a curve in and the invariance of in a flat family). We also need to check that . This reduce to the case of projective spaces. Let be a closed point. One can put in a chain Using the short exact sequences of the form (given a choice of a section of ), for each , it follows that in , we have Applying the Chern character we obtain that for , which is nonzero. Let be a Weil cohomology. Definition 5 Given a morphism , we define the Gysin map to be the transpose of under the Poincare duality. At the level of cycles, is basically when and zero otherwise (this matches the degree shift in ). Proposition 2 (Projection formula) Let , , then . Remark 7 Using Gysin maps, one has an alternative construction of cycle class maps. For a smooth cycle of codimension , we define where is "1" in . This can be extended to non-smooth cycles by a resolution and defining . Definition 6 A cohomological correspondence from to is an element interpreted (using the Poincare duality and the Kunneth formula) as a linear map . Explicitly, if , then (extended to be zero away from top degree). Let , be the natural projections. Then another way of writing is Namely, pullback , intersect with , then pushforward to . One can check that by the projection formula. Definition 7 Define , . Definition 8 The transpose of is defined to be the image of in under . One can check that . Definition 9 (Composition of correspondences) For , , we define . Lemma 3 Let be the graph of the morphism . Then , , . Remark 8 Everything makes sense in Chow groups too. We will not repeat it later. Our next goal is to deduce the Weil conjecture (except the Riemann hypothesis) from a Weil cohomology (hence the name). We will later see that the Riemann hypothesis follows from the standard conjectures. Let be a cohomological correspondence so that on . Write where is the cohomological correspondence . So . Remark 9 When is the graph of then is the fixed points of counted with suitable weights. Taking and using , we obtain the following refinement. Remark 10 The existence of a cycle giving rise to is still conjectural. Now let and be the (absolute) Frobenius morphism. Then is the fixed point of for any . Theorem 4 (Grothendieck and others) There exists a Weil cohomology on , . To interpret the left hand side as the fixed points of , we need the following lemma. Lemma 4 and intersect properly: every irreducible component of is of codimension (i.e., the codimensions add). So can be computed as a sum of local terms, one for each point in . Moreover, the local terms are multiplicity-free (by computing the tangent space intersection at an intersection point ). The Weil conjecture (expect the Riemann hypothesis) the follows. Combining this cohomological expression of with the Poincare duality, we also obtain the functional equation of (part of the Weil conjecture). Corollary 5 Here is the Euler characteristic of . Definition 10 Let be a smooth quasi-projective variety. For any proper (this is not serious since we will be working in ), we define pushforward cycles by when and 0 otherwise. On the other hand, we defined pullback of cycles along a flat morphism (Definition 3 c)). We would like to make sense of pullback for more general classes of morphisms. Moreover, such pullback should be compatible with the pullback on cohomology under the cycle class maps. This can be done if there is a cup product (intersection pairing) on the group of cycles, by intersecting with the graph of . This is not naively true since the two cycles may not intersect properly (the codimension is wrong). So first we restrict to properly intersecting cycles whose intersection has all components of the right codimension. Then should be a sum of irreducible components of with multiplicities here is the local ring of at the an irreducible component of the intersection . This formula of intersection multiplicities (due to Serre) defines an intersection product for properly intersecting cycles. To deal the general case, the classical approach is to jiggle to make the intersection properly meanwhile staying in the same rational equivalence class (moving lemma). Definition 11 We say two cycles of dimension are rationally equivalence if is generated by terms of the following form. Let be a -dimensional closed subvariety and take its normalization ; these generators are the proper pushfowards for . An alternative approach is to consider a dimension closed subvariety. Then the rationally equivalent to zero cycles are generated by , here is the fiber of in . These two definitions are equivalent. One can check that being rational equivalent is a equivalence relation. We denote it by . Definition 12 The Chow group (with -coefficient) . Chow's Moving Lemma then gives a well defined intersection pairing on the Chow groups This makes a graded and commutative unital ring. The proper pushforward descends to the level of Chow groups. Definition 13 We define the pullback on Chow groups for proper by . becomes a ring under intersection product (the intersection product is defined by demanding the analogue of Chow's moving lemma for ). For any (since is proper, makes sense at the level of cycles), if , then . So descends to . Similarly, the pullback descends to . and are related by the projection formula . Example 7 We showed last time that on is an adequate relation. Example 8 For any Weil cohomology , the cohomological equivalence is an adequate relation. Here if in . Notice that a priori these cohomological equivalences may not be independent of the choice of . If two such Weil cohomology theories are related by comparison, e.g., and , then the corresponding cohomological equivalences are the same. Example 9 We say is numerically equivalent 0 if for all , , here the degree map , (one can think of it as , for the structure map ). Then is an adequate relation. is the finest adequate equivalence relation. is the coarsest adequate equivalence relation. Let be an adequate relation. We want to show that if , then . By definition, is linear combination . Let and be the projections. Then Suppose we knew that . Then by the definition of adequate relation , we know . So we reduced to show that on . Let (assume for simplicity). Since is adequate, we can find intersecting properly with , i.e., with . We can certainly write down a map such that and . Explicitly, Therefore we have a chain of equivalences as desired. Definition 15 Let be an adequate equivalence relation on . Let be field of characteristic 0 (e.g., ). We define , the ring of cycles on modulo . Remark 11 The composition law we gave for cohomological correspondences works as well for correspondences (Definition 9). Namely, the composition is given by In particular, becomes a ring, which will end up being endomorphisms of as a motive modulo . Definition 17 We define the category (the coefficient field is implicit) of pure motives over modulo . Its object is of the form , here is an idempotent in and is an integer (Think: ). The morphisms are given by Here the existence of Tate twists allows one to shift dimensions (e.g, a map . is pseudo abelian ( = preadditive and every idempotent has a kernel). Grothendieck conjectured (Standard Conjecture D) that for , for any Weil cohomology . He also conjectured that is abelian. Hence under Conjecture D, is abelian. Conjecture D is still widely open, but in the early 90s, Jannsen proved the following startling theorem. For any , is a finite dimensional semisimple -algebra. That means that the numerical equivalence is arguably the "unique" right choice for the theory of motives. Let be an additive tensor ( = symmetric monoidal) category. One can check for the unit object , then endomorphisms is a commutative ring and becomes an -linear category. Definition 18 We say a category is rigid if for any there exists ("dual") and morphisms such that the composite map is and the composite map is . Remark 12 The rigidity condition gives internal homs: the functor is represented by an object . Indeed, given a morphism , one obtains a morphism (and vice versa). Definition 19 Let be a field. A neutral Tannakian category is a rigid abelian tensor category with and for which there exists a fiber functor . By a fiber functor, we mean a faithful, exact, -linear tensor functor. It is neutralized by a choice of such a fiber functor. (Think: the category of locally constant sheaves of finite dimensional -vector spaces on a topological space ; a fiber functor is given by taking the fiber over ). is the identity on . We have a natural functor sending to the representation which on -points is given by for . The main theorem of Tannakian theory is the following. Theorem 6 Let be a neutral Tannakian category over and let be a fiber functor. Then the functor on -algebras is represented by an affine group scheme over and is an equivalence of categories. Remark 13 Even if we assume the Standard Conjecture D that , is not Tannakian. This is because any rigid tensor category has an intrinsic notion of rank: for , the composite in is called the rank of . For example, in , the rank of is simply the dimension of ; in , because introduces a sign , the rank of is the alternating sum , where is the -th graded piece of . But any tensor functor preserves the rank, so the tensor functor tells us that has objects of negative rank, hence (using the usual commutativity constraint) does not admit any fiber functors. Lemma 6 Suppose . Assume (Conjecture D) and that all Kunneth projectors are all algebraic cycles (Kunneth). Then (with -coefficients) is an a neutral Tannakian category over . For any , and an abelian variety, is true. For a finite field, then is true for any (with respect to any Weil cohomology satisfying weak Lefschetz). This is a theorem of Katz-Messing. Deligne's purity theorem on allows one to distinguish different degrees. Katz-Messing shows that for any Weil cohomology with weak Lefschetz, the characteristic polynomial of the Frobenius on agrees with that on the -adic cohomology. Choose a polynomial such that (for ) and , then is algebraic (as the combinations of the graphs of ) and is the projection onto . Remark 14 Here is a consequence of Kunneth: For any , lies in by Corollary 3. In particular, the minimal polynomial of on has -coefficients. If is further is an isomorphism on , then is also algebraic as . Definition 21 Let be a Weil cohomology. We say satisfies the hard Lefschetz theorem if for any , any ample line bundle and any , is an isomorphism. Here . Example 11 When and , this is part of Hodge theory. For any and , this is proved by Deligne in Weil II. The hard Lefschetz gives the primitive decomposition of . Remark 15 and are always primitive. One should think of as a nilpotent operator on , then the Jacobson-Morozov theorem implies that this action can be extended to a representation of . The primitive parts are exactly the lowest weight spaces for this -action. There exists a in extending . Given , for any semisimple such that , there exists a unique -triple . Let . Then is semisimple and sends to . So applying Jacobson-Morozov gives a unique -triple (the name comes from Hodge theory). Moreover, it follows that . Definition 23 A more convenient operator, the Hodge star , can be extracted as follows. The -action on gives rise to a representation of on . Suppose is the weight eigenspace for . Then is in the -eigenspace. But is not quite an involution. So we renormalize and define on and then . Definition 24 Another variant is the Lefschetz involution for . Then as well. It differs from from certain rational coefficients on each primitive component. For , for (so it satisfies ). The following lemma is immediate. Lemma 7 , , , , , are all given by universal (noncommutative) polynomials in and . All of them contain and . Now we can state various versions of the Lefschetz Standard conjecture. Conjecture 1 (Weak form ) For , is an isomorphism (i.e., it is surjective). Conjecture 2 (Strong form ) The operator is algebraic. Namely, it equals to the cohomology class a cycle in . is stable under (or ). For all , the inverse of is algebraic. Remark 17 It follows from previous discussion that a)-d) are equivalent. e) a) uses something we haven't written down (but not harder). Corollary 8 Under and , if is algebraic and induces an isomorphism . Then is also algebraic (see Remark 14). Corollary 9 is independent of the choice of the ample line bundle giving rise to . The standard conjectures B and C both follow from the Hodge conjecture. The only standard conjecture does not follow from Hodge conjecture is the Hodge Standard conjecture. It concerns a basic positivity property of motives. Take . For any , carries a pure -Hodge structure of weight . More fundamental in algebraic geometry is the polarizable -Hodge structure. Remark 18 Notice that unless (i.e., ), hence unless . Remark 19 Notice also that different pieces of the primitive decomposition are orthogonal. Namely, if , , where are primitive, then unless . In fact, we may assume that , then The claim follows because and is primitive. We would like to study the positivity properties of by reducing to particular pieces of the bigrading and the primitive decomposition. Theorem 8 (Hodge index theorem) On , is definite of sign . Example 13 On a surface , on has sign , and sign on . So is negative definite on , positive definite on and positive definite on . For example, if is a K3 surface, then has signature on and has signature on . This theorem is the source of polarization in Hodge theory. Definition 26 A weight -Hodge structure ( is a -vector space, ) is polarizable if there exists a morphism of Hodge structures such that is positive definite. So the Hodge index theorem has the following corollary. Remark 20 For general Kahler manifolds, the Kahler form only gives rise to polarization of the real Hodge structure. Remark 21 One can further polarize by variants of with sign changes for non-primitive pieces. Now we would like a (weak) version of this that makes sense for any field and any Weil cohomology satisfying hard Lefschetz (so the primitive cohomology still makes sense). Inside there is -vector subspace . Conjecture 3 (Hodge Standard Conjecture ) For any , the pairing on given by is positive definite. Corollary 11 For and , holds unconditionally. We now explain that for , the Hodge Standard conjecture implies the Riemann hypothesis. A more convenient reformulation of is that the pairing is positive definite. It follows that there is a positive involution on (acting on ) given by Explicitly, (which is algebraic under Lefschetz). So we want that the eigenvalues of the Frobenius on are pure of weight . We renormalize the Frobenius (acting on ) as Under Lefschetz, . We want all eigenvalues of has absolute value 1 for all complex embeddings. This can be obtained by realizing as a unitary operator on the inner product space ( ). We notice that commutes with and , so We claim that , so that is -invariant. This follows from the following more general lemma. One can check that ( is the chosen ample line bundle), so the following lemma applies to . Then is invertible and . It follows that is unitary with respect to the inner product (the positivity follows from and the fact that ). In particular, the eigenvalues acting on have all absolute values 1. Hence by Cayley-Hamilton, the roots of characteristic polynomials of on have all absolute values 1, as desired. (so in characteristic 0, the hard Lefschetz implies everything). In fact, if the intersection pairing is non-degenerate, then follows. But we know from that is non-degenerate, so implies that the first intersection pairing is also non-degenerate. : Jannsen's theorem implies the algebra is semisimple, then Smirnov's algebraic result on semisimple algebra's with raising operators implies . Under the standard conjectures, . has all categorical properties we want: (say ) it is -linear, semisimple, neutral Tannakian (this gives unconditional motivic Galois formalism). lets you prove some unconditional results and formulate interesting but hopefully more tractable than the standard conjecture problems. Remark 23 These inclusions are unconditionally true. The Hodge conjecture says that the Hodge cycles are algebraic cycles, so all inclusions are conjectured to be equal. One can try to prove the last two inclusions are equal, which would already be a big step further towards the Hodge conjecture. Definition 27 An absolute Hodge cycle on (suppose has characteristic 0 and finite transcendence degree) is a class in where , such that for all , the pullback class comes from a Hodge cycle in (a -vector space) via the comparison isomorphisms. Remark 24 Due to the transcendental nature of , the last imposed condition is rather deep. Theorem 9 (Deligne) Any Hodge cycle on an abelian variety ( ) is absolutely Hodge. One should think of this as a weakening of the Hodge conjecture for abelian varieties. Theorem 10 (Andre) Any Hodge cycle on an abelian variety ( ) is motivated. Example 14 One classical application of absolute Hodge cycles is the algebraicity of (products of) special values of the -function like (with refinements giving the Galois action). The origin of this comes the periods (i.e. coefficients of the matrices in the B-dR comparison theorem) of the Fermat hypersurface For an algebraic cycle (defined over ) and a differential form such that , then one obtains a period The same principle applies for an absolute Hodge cycle. A good supply of absolute Hodge cycles for Fermat hypersurfaces are the Hodge cycles by Deligne's theorem for abelian varieties (the motive of Fermat hypersurfaces lie in the Tannakian subcategory generated by Artin motives and CM abelian varieties). More generally, let be a number field and a smooth projective variety. Let be the field generated by the coefficients of the period matrix. The relations between periods are predicted by the existence of algebraic cycles. The transcendence degree of is equal to the dimension of the motivic Galois group (when one makes sense of it). For the motive (defined by absolute Hodge cycles), we have . Deligne's theorem implies that the later is equal , the dimension of the Mumford-Tate group (the Hodge theoretic analogy of the motivic Galois group). Definition 28 Let be a -Hodge structure. The Mumford-Tate group is the -Zariski closure of the image of (i.e., the smallest -subgroup of whose -points containing . Notice a priori, one only knows the inequality (since absolute Hodge cycles Hodge cycles). Example 17 Here is another application due to Andre. Suppose is finitely generated. Let , are K3 surfaces over with polarizations (the important fact is that for K3 surfaces). Then any isomorphism of -modules arises from a -linear combination of motivated cycles. Also the Mumford-Tate conjecture is true for : namely, is equal to the connected component of the Zariski closure of the image of on . This is not known even for abelian varieties: there are a lot of possibilities of Mumford-Tate groups for abelian varieties, but for K3 surfaces they are quite restricted. Let be the orthogonal complement of Hodge cycles (the transcendence lattice which is 21 dimensional generically). Then is a field because , and is either totally real or CM due to the polarization. A theorem of Zarhin shows that in the totally real case the Mumford-Tate is a special orthogonal group over and in the CM case a unitary group over , with the pairing coming from the polarization. Let be a Weil cohomology with hard Lefschetz. Fix a subfield (e.g. ). Definition 29 (Motivated cycles) is defined to be the subset of elements of of the form for any and any algebraic cycles. Here is the Lefschetz involution associated to a product polarization on . The idea is that we don't know Lefschetz and so we manually to add all classes produced by the Lefschetz operators to algebraic cycles to get motivated cycles. Remark 25 One can relate to (this is is cleaner in terms of the Hodge involution ). Under Kunneth, maps to the raising operator and the semisimple element maps to . Since Kunneth is an isomorphism of -representations, we know that is equal to . The basic calculation (with the above remark) shows the following. is an -subalgebra of (with respect to the cup product). As for algebraic cycles, we define the motivated correspondences similarly. Definition 30 Define with the similar composition law (the target is correct by the previous lemma). Then is a graded -algebra. We also have a formalism of and projection formulas for . Remark 26 For comparable Weil cohomology theories, one obtains a canonical identifications of corresponding spaces of motivated cycles. Remark 27 One can restrict the auxiliary varieties to some full subcategory of stable under product, disjoint union, passing to connected components and containing . The following definition works with replaced by these 's. An object is a triple , , an idempotent in , . We will write for short. If is true for all , then . As before, is -linear and pseudo-abelian. Theorem 11 (analogue of Jannsen's theorem) For any , is a finite dimensional semisimple -algebra, hence is semisimple abelian. Remark 29 is also a rigid tensor category. Because we always have Kunneth projectors, we can modify the commutativity constraint to obtain a neutral Tannakian category over with fiber functor given by . This gives an unconditional Tannakian formalism. Remark 30 Restricting to some family of varieties , we also obtain a neutral Tannakian category , the smallest full Tannakian subcategory containing (the objects are subquotients of direct sums of ). For example, one can take to be a singleton. Then one can define the motivic Galois group , or . This allows us to talk about the motivic Galois group of a particular object . This is the motivic analogue of . Remark 31 For any field , we define to be the category of motives with -coefficients (the objects are -modules in , Tannakian over ). Define to be the motivic Galois group. is pro-algebraic, even pro-reductive over . splits over the maximal CM extension of (i.e., for any and , is isomorphic to for some , where is the maximal CM subfield). Remark 32 The second part follows from the existence of polarization (the Hodge index theorem). Other manifestations of the principle "arithmetic objects have CM coefficients": Frobenius eigenvalues of pure -adic Galois representations are Weil numbers, hence lies in CM fields; the finite component of algebraic automorphic representations should be defined over CM fields (automorphic representations are unitary). Source of motivated cycles: the motivated analogue of variational Hodge conjecture. Conjecture 4 (Variational Hodge conjecture) Over , let be a smooth projective morphism, let . If is algebraic for some , then for any , is also algebraic. Theorem 12 (Andre) The variational Hodge conjecture holds with "motivated" in place of "algebraic". The theorem of the fixed part (from Hodge II). Let us review the theorem of the fixed part and the necessary background in mixed Hodge theory. Theorem 13 Suppose is smooth projective and is smooth. Let be a smooth compactification. Then is surjective. In other words, the image is the fixed part under the monodromy, i.e., . is the edge map in the Leary spectral sequence associated to . By a theorem of Deligne, when is smooth projective, the Leary spectral sequence degenerates at . So is surjective. and have the same image. Since is injective, it follows that and have the same image. Hence is surjective. Proof (Theorem 12) To prove the motivated variational Hodge conjecture. We may assume that is connected, smooth and affine. Given motivated, we want to show that all are motivated. Remark 34 The argument shows that the standard conjecture for implies the variational Hodge conjecture. Corollary 12 Let be a motivated cycle such that a finite index subgroup of acts trivially on , then all parallel transport of are still motivated. Example 18 Let be an abelian variety. Then the Hodge cycles on are known to be motivated, due to Deligne-Andre. The idea of the proof is to put in a family with the same generic Mumford-Tate group, prove for Hodge cycles special abelian variety in the family and then use the variational Hodge conjecture. More precisely, any Hodge cycle on has the form , where we can take to be the product of an abelian variety and abelian schemes over smooth projective curves. So the Hodge conjecture for abelian varieties (not known) reduces to the Lefschetz standard conjectures for abelian schemes over smooth projective curves. Corollary 13 For any abelian variety , . Lemma 11 For , define . A -subspace is a sub Hodge structure if and only if is stabilized by . is a Hodge class if and only if is fixed by . Let be the stabilizer of . Then is a sub Hodge structure if and only if stabilizes if and only if factors through if and only if . Corollary 14 The natural functor from to the category of -Hodge structures is fully faithful and realize as the Tannakian group of (as a subcategory -Hodge structure). Lemma 12 The full subcategory of polarized -Hodge structures is semisimple. Corollary 15 When is polarizable, is a (connected) reductive group. Corollary 16 When is polarizable, is exactly the subgroup that fixes all Hodge tensors. Corollary 17 Let , then giving rises to is exactly the subgroup of fixing all motivated cycles in all tensor constructions. Corollary 18 Let , then . Remark 35 The Hodge conjecture implies that this is indeed an equality. Remark 36 The following much weaker conjecture is incredibly hard: is connected. Unknown except for abelian varieties. Remark 37 The calculation of possible Mumford-Tate groups of abelian varieties, or more generally Mumford-Tate groups of objects of is essentially the Hodge theoretic content of Deligne's canonical models paper in Corvallis. Remark 38 The soft general result of Zarhin gives an upper bound on possible Mumford-Tate groups and algebraic representations occurring in for any smooth projective. In the case, Zarhin showed that simple factors of are all classical groups; any nontrivial representations of a simple factor must be minuscule (the weights have only a single orbit under the Weyl group). In general, the degree controls how large the group and representations can occur. In particular, any exceptional group can't occur as Mumford-Tate groups of abelian varieties. Does even arises as for some polarized -Hodge structure ? This is at least necessary for it to be a motivic Galois group. Proposition 8 A semisimple adjoint group is a Mumford-Tate group of a polarizable -Hodge structure if and only if contains a compact maximal torus. Remark 39 So or for can't arise as Mumford-Tate groups. Any -form of can't arise (though it does arise as the Mumford-Tate group of non-projective K3 surfaces); for a generic projective K3 surface, the Mumford-Tate group is ( has a compact maximal torus if and only if is even). Let explain the case when is simple with compact maximal torus over . Write . Let be a compact maximal torus, fixed by some Cartan involution of . The Cartan involution is essential for the polarization. Namely, is an involution on satisfying the following positive condition: is positive definite. Decompose into the and eigenspaces for . Here matches up with the Lie algebra of the maximal compact subgroup . Now any yields a polarizable -Hodge structure on if and only if is a Cartan involution on . Let us write down . Choose a cocharacter such that for any compact roots and for any noncompact roots . Notice such cocharacters is in bijections with . Extend (trivial on ) to obtain Then acts on the root space by , which is 1 when is compact and when is noncompact. Now use is negative definite on and positive definite on . One knows that gives a polarization on . Using this framework, it is easy to check can't arise as . Example 19 Consider the split form of . . The two compact roots are , . After the break we will construct as a motivic Galois group via the theory of rigid local systems. This is originally due to Dettweiler-Reiter using Katz's theory. Zhiwei Yun gives an alternative proof (also for and ). We will focus on the former, since the latter needs more machinery from geometric Langlands. Example 20 The Kuga-Satake construction is "motivated", i.e., for a projective K3 surface, the attached abelian variety such that which is a priori a morphism of -Hodge structure, is indeed a motivated cycle (i.e., a morphism in ). This implies the Mumford-Tate conjecture for K3 surfaces, etc.. Example 21 (Variation of motivic Galois group in families). Take a -variational Hodge structure (e.g., , for smooth projective) with the holomorphically varying Hodge filtrations on the fibers . (In general, a homomorphic family of Hodge structures on is a local system on with a filtration by holomorphic subbundles ). How does vary for ? For example, let be a modular curve and be the universal elliptic curve. Let . At CM points , is simply a rank 2 torus over . At non-CM points, . Notice that the CM points are dense in the analytic topology. Roughly speaking, there is a generic Mumford-Tate group ( ) and it drops on a countable union of closed analytic subvarieties (the CM points). Now let us give the motivated analogue of a refinement of this assertion. So we need a notion of a family of motivated motives. smooth projective -schemes , of relative dimension , , equipped with relatively ample line bundle . -linear combinations , of closed integral -subschemes of , flat over , such that lies in and is idempotent for any . We denote this family by . Let the exceptional locus does not contain the image of a finite index subgroup of . Then is contained in a countable union of closed analytic subvarieties of . Let be a smooth projective connected curve. Let be a finite set of points. Let . For the time being, we work with the associated complex analytic spaces (so implicitly). Definition 33 A local system of -vector spaces on is a locally constant sheaf of -vector spaces. Remark 40 For , gives an -vector space and for any path , gives an isomorphism (depending only on the homotopy class of ) . So choosing a base point gives rises an equivalence between local systems on with -representations of . Example 22 The case is most interesting for our purpose. Here is a free group on generators. Question Given a local system on , when does come from geometry? By coming from geometry, we mean there exists a smooth projective family such that for some (notice itself is a local system). Theorem 15 Any polarizable -variational Hodge structure over a punctured disc has quasi-unipotent monodromy. Remark 41 This is a hard theorem. See "Periods of integrals on algebraic manifolds III", Publ. Math. IHES 38 (1970) by Griffiths; "Variation of Hodge structure: the singularities of the period mapping" Invent. math. 22 (1973) by Schmid. Both the integral structure and the polarization are important for the theorem to be true. Remark 42 Recall that a -variational Hodge structure is a -local system on and a filtration by holomorphic subbundles of such that on each fiber one obtains a -Hodge structure with the Hodge filtration on induced from , satisfying the Griffiths transversality: . Remark 43 Though the local monodromy generators are quasi-unipotent, when is smooth projective, the global monodromy representation of is semisimple (Hodge II). This is because one gets a polarizable variational Hodge structure. The sufficient condition to come from geometry is still a total mystery. Simpson's guiding philosophy is that rigid local systems shall always come from geometry. Katz's book proves this is the case for irreducible rigid local systems on . There are several notions which you may want to call rigid local systems. Definition 34 Let be a -local system on . is physically rigid if for local system such that for any , , then . In terms of the monodromy representation: if the generators are conjugate (possibly by different matrices), then they are globally conjugate. Definition 35 is physically semi-rigid if there exists finitely many local systems such that if is locally isomorphic to for all (as in the previous definition), then for some . Remark 44 One can also define general notion of -rigid local system for any reductive group . For (the notion defined above), physically semi-rigid implies physically rigid. These two notions are very intuitive but extremely hard to check. The following definition provides a numerical condition and is easier to check. Definition 36 is cohomologically rigid if . Here . Notice is still a local system on (but is no longer a local system on ). Remark 45 Intuitively, being cohomologically rigid means that there is no infinitesimal deformation of with prescribed local monodromy. We shall now explain this intuition in more detail. Fix . Let be the category of local Artinian -algebras with residue field . We define the functor , such that is the set of all liftings of to . Then the familiar fact is that the tangent space Taking the -equivalence into account, and assume that is irreducible (so implies that ), we are motivated to consider the deformation functor , such that is the set of all liftings of up to -equivalence. Then So when is irreducible, measures the space of the infinitesimal deformations of . We further want the deformations with prescribed local monodromy. Let be the generator of . We now consider , sending to the set of -equivalence classes of liftings such that for , are conjugate by an element of . Then the tangent space consists of cocycles such that is conjugate to by an element of . It follows that for any , for some . Namely, Moreover, we claim that this restriction map can be identified with the edge map in the Leray spectral sequence for , So we can identify This motivates the definition of cohomologically rigid local systems. We briefly indicate why the claim is true. For any local system on , notice is the sheaf associated to the presheaf (which is if ). Covering by simply-connected opens, we know that . In a neighborhood of a puncture , we get , which glue to get . The following lemma gives a very useful numerical criterion for cohomologically rigidity. Proof Notice for any local system , the long exact sequence associated to gives . Also by Poincare duality, . The first equivalence then follows from the irreducibility of (i.e., ). For the second equivalence, we use the fact that for any local system on , we have the Euler characteristic formula Notice is nothing but the -invariants of , the desired equivalence follows by applying to (so . Remark 46 In the algebraic setting, the lemma is true for lisse -sheaves on , as long as they are tamely ramified (i.e., is invertible in the base field, which is automatic in characteristic 0). When they are wildly ramified, more correction terms for the wild ramification are needed (known as the Grothendieck-Ogg-Shafarevich formula). Example 23 We denote the Jordan block of length with the eigenvalue by . Take , and . They give a local system on . 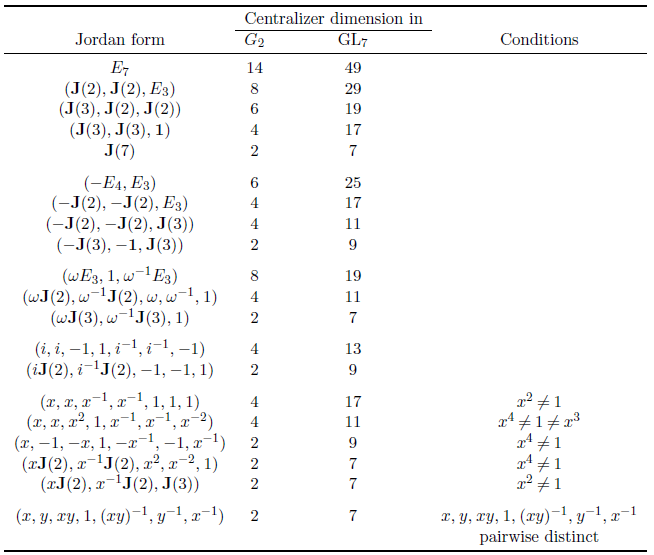 They have Jordan forms , and , all are quasi-unipotent. It actually comes from geometry (classically known) as the local monodromies of the Legendre family Namely, it comes from the local system (e..g, one can see these matrices by Picard-Lefschetz). Moreover, it is cohomologically rigid by the previous lemma: and each . is a pseudo reflection (i.e., ). , with for any . Let be the monodromy group generated by (hypergeometric group). Lemma 14 Hypergeometric local systems are irreducible. Given , one can write down the explicit matrix description for the local monodromies. , and gives a hypergeometric local system with parameters . Any hypergeometric local system with parameters , is -conjugate to the one of the above form. (This is stronger than the physical rigidity because we don't need to specify the Jordan forms). It suffices to show that is pseudo-reflection: indeed has rank 1. Remark 47 The Jordan form of a companion matrix: when an eigenvalue has multiplicity , we obtain a Jordan block . Using this, one can check that a hypergeometric local system is cohomologically rigid. The dimension of the centralizer of is , and the dimension of the centralizer of is . Now adds to 2! What are (the Zariski closure) of the monodromy group of hypergeometric local systems? For example, does appear? Are those with roots of unity always geometric? We saw that hypergeometric local systems are both physically rigid and cohomologically rigid. What is the relationship between physical and cohomological rigidity in general? Not . Beukers-Heckman computed all possibilities: , , and some specific finite groups. Now let us come to the third question in more detail. Proposition 9 Let be an irreducible local system on . Suppose is cohomologically rigid, then is physically rigid. Remark 48 The same result (with the same proof) works for lisse -adic sheaves (tamely ramified) in the algebraic setting. For the other direction, we will use a transcendental argument. This direction is not known in the -adic setting (knowing local monodromy matrices is not enough in the -adic setting: one needs to know continuity). Proposition 10 Suppose . Let be an irreducible local system on . Suppose is physically rigid, then is cohomologically rigid. Remark 49 The implication physically rigid cohomologically rigid works for -local systems for general groups . But the converse is not true for general (on the automorphic side: multiplicity one may fail for general groups other than ). Theorem 17 Let be a field. For a separated finite type -scheme , we have a triangulated category (the bounded derived category of constructible -adic sheaves on ) equipped with a standard -structure such that there is an equivalence of categories For a morphism, we have adjoint pairs and . We also have adjoint pairs for . Remark 50 The category of -adic sheaves is an abelian category, whose objects are colimits of -sheaves, where runs over all finite extensions of . Here an -sheaf is a constructible -sheaves with -inverted. Remark 51 There is an analytification functor from to the corresponding analytic category . This functor is fully faithful but not essentially surjective. For example, take . Then sending the generator to does not extend to the etale fundamental group ( ). Nevertheless, given , for almost all , one can choose an isomorphism , such that lies in the essential image of the analytification functor. The triangulated category is defined to be the colimit of . The latter triangulated category is hard to define (it is not defined as the derived category of -sheaves, which do not have enough injectives). There are 3 approaches to define ..
Use the pro-etale topology introduced by Bhatt-Scholze ( becomes a genuine sheaf). Taking limit is well-behaved for the stable -category version of . The triangulated limit comes for free. Deligne's classical approach: replace with the full subcategory of very well-behaved complexed (these are quasi-isomorphic to bounded complexes of constructible -flat sheaves). Call this full subcategory . Then is naturally triangulated: is a distinguished triangle if is a distinguished triangle for any . Definition 37 is semi-perverse if for any , ; is perverse if and are both semi-perverse, where is the Verdier dual of . Example 25 Suppose is smooth of dimension . For lisse -sheaf on . Then is perverse (since ) but not for other shifts. In general, perverse sheaves are built out of lisse sheaves on smooth varieties. Introducing perverse sheaves allows one to define intersection cohomology for singular proper varieties satisfying the Poincare duality and purity. Another major motivation for us is the following function-sheaf dictionary. When is a distinguished triangle, we have . For , we have for . For , we have (think: is the integration over the fibers) This is essentially the Lefschetz trace formula. Theorem 18 Suppose and are two semisimple perverse sheaves. Then and are isomorphic if and only if for any . Remark 52 A basic fact hinted in this theorem: the full subcategory of perverse sheaves is an abelian category and all objects have finite length. How do we produce more perverse sheaves from the "lisse on smooth" case (Example 25)? Suppose is an affine morphism, the preserves semi-perversity (but not perversity). Suppose is a quasi-finite morphism, then preserves semi-perversity (but not perversity). Corollary 19 If is both affine and quasi-finite (e.g., is an affine immersion), then both and preserve perversity. Here comes the key construction: intermediate extensions. Let be a locally closed immersion. For simplicity, let us assume that is affine, so is affine and quasi-finite. If . Then both and lie in . There is a natural map . Definition 39 Define the intermediate extension (or middle extension) (in the abelian category ). preserves simple objects, injections and surjections. Theorem 20 Any simple perverse sheaf on is of the form for some smooth affine locally closed subvariety of , for some lisse sheaf on . Interesting things happen when extending to the boundary of . Hence the simple perverse sheaves on are either punctual or of the form for lisse on an open dense . Today we will introduce the key operation on perverse sheaves in Katz's classification of rigid local systems: the middle convolution. Example 27 The rigid local system considered in Example 23 is the sheaf of the local solutions of the Gauss hypergeometric equation. The solution has an integral representation Here the parameter determines the local monodromies. More generally, is the solution of This integral looks like namely the (additive) convolution of and . The function corresponds to the rank 1 Kummer sheaf associated to the representation . Similarly, the function corresponds to a tensor product of (translated) Kummer sheaves. So rigid local system can be expressed in terms of the convolution of simpler objects. Here is the precise construction of the convolution. Definition 40 Let be an algebraically closed field. Let be a connected smooth affine algebraic group. Let be the multiplication map. For , we can define two kinds of convolutions and . Remark 53 Even if are perverse, these two convolution may not be perverse. Remark 54 Since is affine, if is semi-perverse, then is also semi-perverse. Definition 41 Suppose such that for all , both and are perverse. We define the middle convolution to be the image of in the abelian category of perverse sheaves. Example 28 Take and . Let be the local system on associated to a nontrivial character . Let , where . Then the middle convolution makes sense: both , preserve perversity, by the following proposition. Proposition 12 Suppose . Let be irreducible such that its isomorphism class is not translation invariant. Then and both preserve perversity. The statement follows from the statement: because is also perverse and not translation invariant, so is perverse; taking dual implies that is perverse. For , then is perverse if and only if is semi-perverse: is semi-perverse since is affine. is perverse for any irreducible . is an irreducible intermediate extension, i.e., there exists open dense on which is lisse, irreducible and . is tame, i.e., the corresponding -representation is tamely ramified at the punctures . has at least two singularities in . Notice if , then a) and b) implies c). (In particular, . Now we can state the main results (slightly specialized) about the middle involution. For lisse on , define the index of rigidity (so is rigid if and only if ). Then for any . Let us explain some of the ideas of the proof without going into details. Remark 55 The key step is to show that preserves the subcategory consisting of irreducible perverse sheaves such that and preserve perversity (we will say satisfies property for short). Then and its complement can be described explicitly (e.g., ). Bare-hand calculation shows this complement is also preserved under . The first key step has a proof which works in any characteristic. But in characteristic , the approach of Fourier transform is more pleasant, which we shall now briefly discuss. If has characteristic and . It turns out that the category on satisfying is equivalent to via the Fourier transform. The middle convolution on then corresponds to on (as in the classical Fourier theory: the Fourier transform of the convolution is the product of the Fourier transforms). Definition 43 We now define the Fourier transform, which is a functor . Fix an additive character and denote the associated the Artin-Schrier sheaf on by . Let be the two projections . Motivated by the classical Fourier transform we define where is the pullback of via the multiplication map. Similarly define using . It turns out that and we denote it by for short. It follows that preserves since projection maps are affine and the duality switches and . Moreover, is involutive: In particular, is an auto-equivalence of . Remark 56 Now we can check that has property . Using the Fourier transform, it suffices to check that lies in . The first factor in since has property , and the second factor is in because also has property (Example 28). Hence the is in . Remark 57 Suppose is irreducible, then is also irreducible by the exactness of the Fourier transform. It is easy to see that with a rank one object is invertible on : i.e., if is rank one with lisse and with lisse, one check that is the identity map. Applying this to , we know that is again irreducible. Using Theorem 21, we can prove the Katz's classification theorem of tamely ramified cohomological rigid local systems. Besides , we also need a simpler twisting operation: If is rank 1 lisse on , we define The index of rigidity is easily seen to be preserved under . Given an irreducible tame cohomological rigid local system on , our aim is to apply a series of and 's (these are all invertible operations) to obtain a rank 1 object (which is easy to understand). Theorem 22 (Katz) Suppose . Assume is lisse on (so ) and cohomologically rigid. Then there exists a generic rank 1 lisse on and a nontrivial character such that has strictly smaller rank than . Also, we can arrange and to have local monodromies contained in the local monodromies of . So the local monodromies of is contained in the local monodromies of . In particular, if all th eigenvalues of the local monodromies of are roots of unity, then we can arrange the same for . Proof For , we write Similarly, at , we write For , we write to be the number of Jordan blocks of length in the unipotent matrix (which can be viewed as the dual partition of ). To guess what to do, we look at the rank formula (proved via Fourier transform by Katz): for any nontrivial , If we want to drop the rank, we want to maximize the number of eigenvalues 1 by twisting and then take the middle convolution with respect the that maximizes . For each , we choose such that is maximal. We form of rank 1 such that , i.e., Then has larger than for any . We replace by the resulting twist and choose such that is maximal. In order to apply Katz's rank formula, we claim that any such is nontrivial. Assume this claim is true. By the rank formula and the Euler characteristic formula, we have So to see the rank actually drops, we just need to show that For this we need the cohomological rigidity The last term can be written as By the maximality of , we know the last term is at most So the cohomological rigidity implies that which implies what we wanted since where by definition. Corollary 20 Given a tuple of monodromies (at each ), we can apply Katz's algorithem above to determine whether this tuple actually arises as local monodromies of an irreducible cohomologically rigid local system. This solves the Deligne-Simpson problem in the cohomologically rigid irreducible case. where is a primitive root of unity. Exercise 1 Starting with the above local monodromies, apply Katz's algorithem to reduce to the rank 1 case. Let be an algebraically closed field of characteristic not (or 2). In each case, the monodromy group (the Zariski closure of the image of the monodromy representation) is . Let be cohomologically rigid, ramified at and have monodromy group . Then is ramified at exactly two points of . Moreover, up to permuting , is conjugate to one of the local systems above. Remark 58 There are more local systems which are wildly ramified. Proof We start with the second part. Suppose is lisse exactly on , we want to know how big is. Since is cohomologically rigid, we have We look at the table of the centralizers of conjugacy classes of in (copied from Dettweiler-Reiter), we see the largest dimension is 29. We can rule out all these three cases due to the necessary criterion for irreducibility: . Namely, the Euler characteristic formula tells us that or For example, case is ruled out because then the Jordan form is by the table: if we twist by the character with local monodromies at the three finite points (and at ), we then get a new local system with local monodromies , which violates the above irreducible criterion. Other cases are similar. The first part the follows by checking which of these possibilities can arise using Katz's algorithm. For example, take the case at the third point . Write for the rank 1 local system with local monodromies at and at . Twisting by we get , and . Then the rank formula together with the table tells us that the rank of the middle convolution is equal to , with local monodromies , , . Twisting by and take middle convolution, we obtain local monodromies , , (rank 5),... until we get down to , , (rank 2) and (rank 1). The last rank 1 local system actually exists since . Now running the algorithm reversely proves that the original local system also exists. The final thing to do is to prove the monodromy group is actually . First notice that our monodromy representation is orthogonal. The dual representation has the same local monodromies (up to -conjugacy); since is physically rigid, this implies that . Since the dimension 7 is odd, must be orthogonal. So maps into . At : the is the image of of in via the 6-th symmetric power Since is the same as the number of irreducible constituents of this -representation, we know . At : the local monodromy is semisimple and it is easy to see that the dimension (either two 's or no 's). At : the local monodromy is the image of of via . The number of irreducible constituents of is 13. Remark 59 One reason that the same realization of is harder: an irreducible subgroup of containing a regular unipotent element can be . Another special feature about is that these rank 7 rigid local systems are also rigid when viewed as -local systems (via the adjoint representation). Remark 60 We wrap up with group theoretic consideration of the conjugacy classes of . In particular, we explain why the three conjugacy classes constructed as local monodromies actually lies inside . Take a basis of simple roots . So (simply-connected and adjoint). Take the dual basis , so . The fundamental weights are and . Using fact that ( are fundamental weights), one can find , . 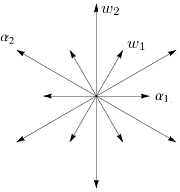 The 7-dimension representation has weights (the nonzero weights form a single Weyl orbit, so it is quasi-minuscule). The semisimple case is easy: gives the torus . Taking gives exactly . is the regular nilpotent orbit (the unique maximal nilpotent orbit) in . In general does not necessarily take regular nilpotents to regular nilpotents, but this is the case for . In fact, to compute where the principle -triple in goes in , just compute the pairings (since for any simple root ). It follows that the composite is the 6-th symmetric power, hence maps to the regular nilpotent class. Let be an algebraically closed field, . Fix an order of quasi-unipotence ( ) and fix a primitive -th root of unity. Let and be a cohomologically rigid local system, lisse on with eigenvalues contained in . We will show how to produce a local system over the arithmetic configuration space of points, whose geometric fibers over are cohomologically rigid objects in lisse away from and one of which gives the original . The universal rigid local system will live on , i.e., Notice that one can specialize to via . Theorem 24 Fix (inducing ). There exists a lisse -sheaf on , which, after specializing along , recovers . Let . The restriction of to any geometric fiber is a cohomologically rigid object in the corresponding category (i.e., specialization preserves index of rigidity, tameness, irreducibility, and in some sense preserves the local monodromies as ). is pure of some integer weight. The characteristic polynomials of the Frobenius (when specializing to a finite field) lies in . For any other prime and . There exists a lisse -sheaf on satisfying for any , the characteristic polynomials of on is equal to the characteristic polynomial of on in . In other words, we get a compatible system of -adic representations. Proof We will need to make sense of middle convolution in this relative setting to run Katz's algorithm. Admitting that there is a well-behaved notion of middle convolution on for some reasonable ring (e.g, ), we can induct on . When . Let be the local monodromy character, of order dividing ; so . Now we can spread this out by interpreting as associated to a Galois covering with Galois group . From the fixed map , we can identify , so we can view as a character of the Galois group of the covering In this way we obtain a lisse sheaf on . Then works. Let be a normal domain, finite type over . Let be a divisor given by the equation , where are all distinct. Let be another divisor given by . Remark 61 For the application, , is union of -hyperplanes, given by ; , given by . The middle convolution is an operation where is given by . For the application, since . Then we have the following diagram where are the projections and is the difference morphism. We denote . Then the compactified projection is proper smooth. Proposition 13 Assume either that everything is tame or has a generic point of characteristic 0.
and are lisse and tame. Assume is pure of weight and is pure of weight . Then is mixed of weights ; is pure of weight . Even better, the middle convolution the top graded piece in the weight filtration of the naive convolution. Assume or is geometrically irreducible and nonconstant. Write for short. Then unless . a. Let us take . Then is the complement of hyperplanes in the and directions and the diagonal. Recall that is the sheaf associated to . Since the projection is trivialized with respect to the stratification , it can be computed as . It follows that the middle convolution is lisse. For a formal proof, see Katz, Sommes exponentielles, Section 4.7.
b. Recall that if is an -sheaf on (a scheme of finite type over ), we say that is pure of weight if for any closed points , is pure of weight in the familiar sense. We say is mixed if it admits a filtration by subsheaves such that are all pure. Theorem 25 (Weil II) Suppose is a morphism of schemes of finite type over ( is invertible on ). If is mixed of weight on then is mixed of weight . Theorem 26 If is a smooth curve, lisse on pure of weight , then is pure of weight . This result is less surprising by noticing that (the source is mixed of weight and the target is mixed of weight ). To show the graded piece statement, we use the short exact sequence of sheaves which gives a long exact sequence The last term is zero since is punctual. Since is an open immersion, we know that has weights by 1.8.9 in Weil II. So we are done since -term is mixed of weight . Remark 62 We claim that Definition 46 does recover the old definition of the middle convolution (Definition 41) when is an algebraically closed field. This finalizes the description of the middle convolution algorithm in the universal context: it produces local systems on that specializes to cohomologically rigid tame irreducible local systems on for algebraically closed. Notice by definition where and . Since one can replace by (Example 26) and hence the claim follows from This is a special case of the following theorem (take , , ). Theorem 27 Suppose is affine open, is separated finite type of an algebraically closed field . is proper and is finite. Suppose such that and are perverse. Then in . Remark 63 Our next goal is to show that these universal cohomologically rigid local systems have the following geometric realization: there exists a smooth family with a finite group action and an idempotent such that Moreover, for any , .